Every family is unique and so is every divorce or separation. 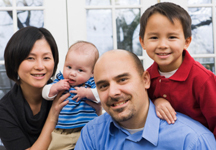 Collaborative Practice can offer solutions that fit with your families’ unique background and needs. Collaborative Practice is all about solving problems creatively and settling cases outside the court room. In the Collaborative process your team of professionals helps you to focus on your goals and interests to reach a solution that is right for you and your family without the intervention of the court system. To get you on the right path to a collaborative process it is useful to look at some real life stories on how collaborative practice worked in real families’ lives. Collaborative practice can help you to successfully develop parenting plans, divide financial assets and move forward. Jean had been through the court system for his separation from Martha. The court process took over 2 years and cost both John and Martha a significant amount in legal fees. Jean remained in the matrimonial home in Bracebridge and Martha moved to Barrie to continue her work as a surgeon. At the time Jean and Martha had three young children. At the time Jean received custody of the children and Martha had weekend access each alternate weekend. The children are now all teenagers and the two youngest children have expressed to Martha that they would like live with her in Toronto. Martha has raises this issue with Jean but he is apprehensive to agree to any changes for the children’s residence. Both Martha and Jean wish to avoid the protracted, expensive and painful process that had been their experience previously. They decide to enter into a collaborative process and sign an amending agreement. Bruno and Nicki have been married for 15 years and lived together for three years prior to that. They have one daughter, Chelsea, who is 16 years old. Nicki and Bruno agree that Chelsea will reside with Nicki and have liberal access with Bruno according to her wishes. Bruno and Nicki both plan to live in Barrie. However Bruno and Nicki do not know how to work out monthly child support payments and also what should happen for child support when Chelsea goes to University in Toronto. They have been running a home decorating business together for the past 6 years. Nicki works mainly in the business. They both currently get paid from the business but they are not sure what they should do with the business now. Nicki wants to keep the business for herself. Bruno also works in construction as an employee of a local company. Bruno had decided to divorce after many years of deep unhappiness and a year of marriage counseling. It was a painful decision for both of them. The do not want to fight this matter in court but they are concerned that there is a lot at stake financially and they are worried that it could get very complicated in court. On the other hand they are worried that if they do not go to court then they might not be protected financially and might not get what they are entitled to financially. They decide to enter into a collaborative process and jointly appoint a collaborative financial specialist to help them to complete sworn financial statements and to have the business valued and to work out a fair income from the business for Nicki. They also negotiate the issues of child support and spousal support amount and duration. Ben, 41 and Dean 42, had been in a common law relationship for 15 years and married five years ago. Ben, a corporate lawyer, earns a good income, considerably more than Dean, who is a high school teacher. They decided to adopt a child and because Ben had the higher income, he became the adoptive parent of Maximillian, who is now 3. The parties decided that Dean would become a stay at home dad and take responsibility for raising Max as well as caring for the family home and Ben would be the sole financial support. This was working quite well until the couple decided their relationship was not working and they decided to split. Six months has passed since the separation. Ben has moved into their beach home, and Dean stays in the family home with Max. Ben has now heard that Dean is in a new relationship. Ben is concerned that it is too soon after the separation for Max to be introduced to new partners. Ben is also starting to consider that he would like to spend some more time with Max. Ben and Dean have always been able to talk but tensions have been getting greater lately. Ben does not want to upset Dean. The parties decide to enter in a collaborative process to complete a separation agreement and also to jointly appoint a parenting coach to look at the issues of a parenting scheduled and to discuss the issue of introducing new partners.